AmeriCommerce can calculate tax for you. AmeriCommerce's rate calculation system is based on tax regions and tax rates. Tax regions are a geographic area defined by specifying state(s), postal code(s), and/or countries. Tax rates are applied to tax regions. You can apply different tax rates to different tax regions. To get started calculating taxes with AmeriCommerce's internal tax rate system, see Step 1 and Step 2 below for setup instructions. AmeriCommerce also integrates with popular tax calculation software like Avalara and Taxcloud. For more information, see Tax Integrations. Optionally specify which store the tax applies to (if you have a multistore). Shipping that is charged for taxable items is itself taxable. If some items in the order are non-taxable, tax is only applied to the percentage of the shipping that is equal to the dollar amount percentage of the taxable items in the total order amount. Example: An order is placed with 2 items, one costing $10 which is taxable, and one costing $5 which is not taxable. The taxable amount of the total order is 66%. Tax will be applied to 66% of the shipping. Customers and products can be marked as non-tax. To flag a product as non-tax, navigate to Catalog > Products > Edit Product > General, and scroll until you find the non-tax check box. Troubleshooting Tip: If you have two tax regions with the same state your tax may not get charged correctly at all times. The correct way to set this up is to assign a sort order to the region you want it to pick up. Example: If you have two regions setup '48 United States' and 'Texas' - Texas falls under both regions. When you set up Texas tax rates - to correctly charge taxes for Texas add a higher sort order to 'Texas' in the region area than '48 United States'. Setting a higher sort order for the exact region you want taxes applied to will apply the tax to that region. 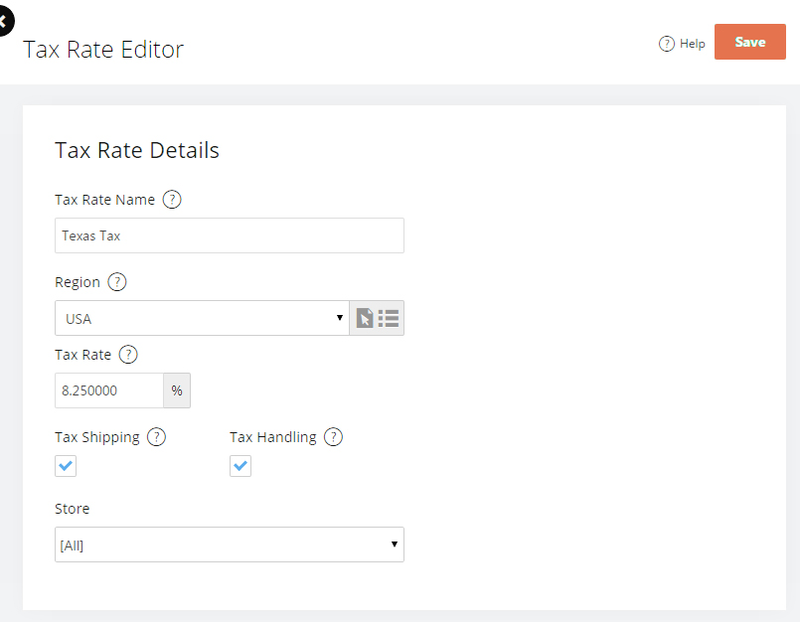 Troubleshooting Tip: If, after setting up the tax regions and tax rates, the shopping cart does not calculate the taxes, confirm that the product is not set to non-taxable. You can check this by navigating to Catalog > Products > Edit Product > General. What if you are in a state where taxing shipping is optional? How do you set it up so that shipping is tax exempt?